Subject description: Available in 'buntu-based Puppies.....and NOW available as a .pet package for non-'buntu Pups, too! Now, then. I know many of us like to be able to record what happens on our desktops, for various reasons. SimpleScreenRecorder is a very well-known app for doing just this, developed by Maarten Baert. Several compilations have been posted on the Forum at various times, and some of the more recent Pups have it installed by default, OOTB. I use it myself, to great effect. But did you know that there's something even simpler in the repos of the Ubuntu-based Puppies (Tahr, Xenial.....even good old Precise)? It's called (very aptly!) 'RecordMyDesktop'. Simple.....and obvious. Apparently, it's been there for years. Nothing to it. You can set the video and sound quality, as a percentage. You can select a 'region' of your screen to record; if this isn't selected, it records full-screen by default. You can choose where to save it, and under what name.....and there's the 'Record' button. The 'Advanced' settings give you a few more options, under four different tabs; 'Files', 'Performance', 'Sound' & 'Misc'. Two tips. Under the 'Sound' tab, change that 'DEFAULT' to 'default'; ALSA won't find it unless you do. And change the frequency from 22050 to 44100 Hz. There's an option to compress it, under the 'Performance' tab; I haven't yet tried this, although, apparently, you shouldn't bother. You degrade the video quality dreadfully if you do. You'll find it runs well over the 100% mark before it quits; this seems to be quite normal. I've got it installed in Xenialpup, Tahr 6.05, and Tahr64, and it's the same in all of them. When finished, unless you've specified differently before recording, the file will be in /root by default. It plays back in most of our media players quite happily; VLC, MPlayer, and SMPlayer, too. It seems quite a useful little app, and certainly works very well. I'm going to try uploading to YouTube in a bit, and see whether the .ogv format is accepted or not. Edit:- Yep, the .ogv format is accepted by YouTube with no fuss whatsoever. Deleted - hit the 'Submit' button twice! Thanx I make a lotta really lame musicvideos for my lame keyboardmusic - so this will definitely come in handy ! Cool if u share other gems of software u come across. Used a lot by Ubuntu (forum ubuntu). hum hum hum our little Puppy has many alternatives. I've produced a .pet package of RecordMyDesktop. As stated above, it's generally available through the repos of any of the 'buntu-based Pups; remember to install 'gtk-recordmydesktop' in addition to 'recordmydesktop', or otherwise you'll be stuck with command-line operation! The reasons I've put together a .pet of this are two-fold. One, I run various Pups that are not 'buntu-based, and (as I've stated many times before) I like to adhere to the Puppy maxim of 'choice in all things'. I happen to think this is a pretty neat screen-capture tool; I know many of you prefer SimpleScreenRecorder, but to me, this produces a smoother, less 'jerky' output. I've tested this in Slacko 5.7.0 & Slacko 5.6.0, and it works perfectly. The other reason I put this together is because I've recently started using greengeek's 'VoxPup', based on Upup Raring (with experimental voice control). Okay, I know what you're thinking; 'Isn't this a 'buntu-based Pup?' Indeed it is.....but what y'all need to remember is that Upup Raring was based on Ubuntu 13.04 'Raring Ringtail', which was one of the intermediate, short-term versions between the LTS (Long Term Support) releases, which are supported for 5 years. The short-term releases are only supported for 9 months, before the repos are archived, and become basically inaccessible to the public. The upshot of this is that Raring's repos went off-line years ago (probably before I even joined the Forum), and no longer connect, much less function. So, my 'Raring' has been set up entirely with .pet & SFS packages. And it works pretty well, too! I really can't see these still being online after 'Artful Aardvark' goes on release in a few days time..! 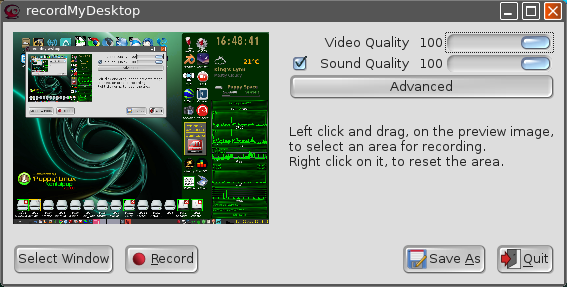 RecordMyDesktop works entirely with open-source codecs; it produces a file in an OGG 'container', utilising Theora for the video component, and Vorbis for the audio. The output goes to a file in /root called 'out.ogv' (you can of course name this anything you want to; it will still have the .ogv extension - for OGG). It plays back happily in both VLC and SMPlayer. I can't entirely figure out whether this makes use of ffmpeg, or libavutils, etc (or whether it's entirely handled by Python); the available documentation doesn't make this at all clear. FFmpeg is usually available via the PPM, if required. 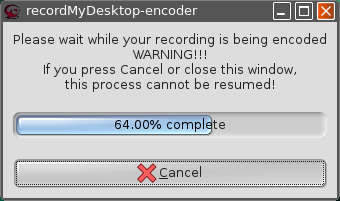 Do remember, as I stated above; the 'encoding' session which takes place after closure very often runs on to well over 100%, as reported by the progress bar. This appears to be perfectly normal; just be patient! I admit it does seem to take rather longer in the Slackos than it does in the 'buntus.....but it still gets there (eventually!) Perhaps something 'extra' is required, although the terminal doesn't report anything missing. It does, however, function as intended. Hi Mike, I'm keen to see if this can work for me on a Slacko 5.6 derivative as I have problems with SSR not letting me record audio via "loopback". (No idea yet how I would set up Gtk-RMD to do it but that is tomorrow's challenge...). What would you recommend as the best package to load in order to cure this? Um. Blimey, I don't really know! I thought I'd try it on the Compaq, and it seems to work nicely. I'm not really the person to ask about JACK; Smithy was trying to explain to me about JACK the other day, but I simply cannot get my head around the settings. 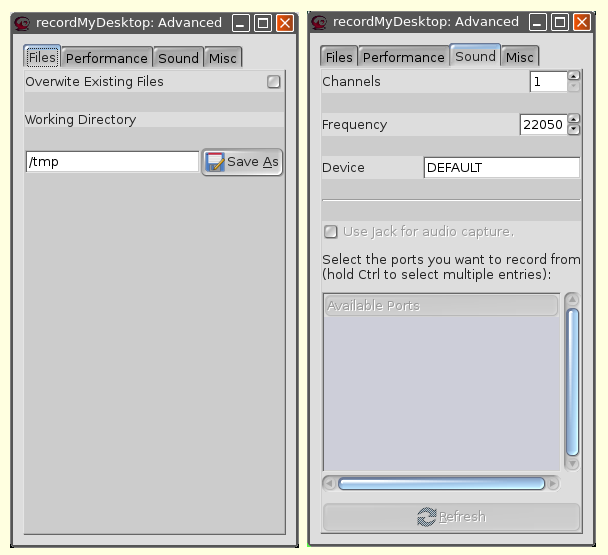 In RecordMyDesktop, there is a section under the Advanced->Sound tab where you can set it to work with JACK, I know.....but it's no use asking me how you do it. Sorry I can't be of more help with that one. If you do manage to get it set up and running, let me know how you achieved it, would you? Just out of curiosity, why d'you want to record audio via 'loopback'? Isn't that, um, kind of self-defeating? Let me know if they do any good for ya. Constructing the RMD package entailed quite a 'lib hunt', but, thankfully, that's all it was. No 'symbol_lookup_errors', or owt like that, fortunately. Hi Mike, thanks for the jack libs - I have started testing with them and it got me past my initial problem but after that I fell into a pit of vipers from which I could not successfully extricate myself (mostly libpopopt wrong version or something...) but I will get back to that at some other time to research further.. The sound card in my laptop lacks any kind of hardware "mix" control so there is no way for me to record an audio stream coming in via browser. This means I am unable to record audio from programmes like skype or Linphone etc. SFR offered a "soft" mixer option for alsa which allowed the user to "loopback" the sound coming out of the speakers into the pcm record stream (or something like that - I'm probably butchering the reality of how it works). Anyway - it allows me to use mhwaveedit to record audio, but I also wanted to occasionally record the contents of the screen video along with the audio but couldn't find a way to make SSR accept the loopback audio. For some reason today SSR works perfrctly with the loopback audio so I am really pleased. However, there is obviously quite a lot of interaction between various audio and video utilities so I need to track what it was that was previously stopping SSR recording audio. If I can get Record my desktop running it might be a better alternative. I've tested this in Slacko 5.7.0 & Slacko 5.6.0, and it works perfectly. Also - just wondering if your testing was done on a fresh (no savefile) boot of 5.6 and 5.7? Had you considered getting an external sound card (which plugs into a USB port)? I bought one myself, last week, for the old Dell lappie.....'cos the 3.5 mm headphone socket's so worn it's almost unusable now.....and in the living room, I normally run an extension lead to an RCA adapter lead, direct into the hi-fi, and play-back through that. 7.1 surround sound, and dual input/outputs for both headphone & mike. For that price, it's not at all a bad buy.....except it's totally OTT for the simple use to which I want to put it (which was to replace the 3.5mm headphone jack socket, without stripping 'er down and soldering a new one in place). I could have done that, but I'm getting kinda lazy in my old age..! Use the 'Multiple Sound Card Wizard' to select the appropriate card, then in Retrovol's 'Config window', under the 'Hardware' tab, enter the appropriate card details, hit 'Apply', and you should have the correct set of sliders for that external card showing. They don't normally have as many sliders to play with as your internal card.....but they get the job done. And, more importantly, most of 'em are just Plug'n'Play, and work OOTB with Linux. Worth a look, perhaps.....and, er, no; just so's you know, I didn't try them out with a 'virgin' boot. P'raps I should have done! The product is good. The only problem is that the sound has the background buzz of the disc or the PC fans. Unfortunately, this boredom can also be heard with background music. Same problem with Simple screen recorder. I've had better experiences by recording sound and video separately. I did even have a short video of a clapper board that I used to add in at the start. I like audacity for its background noise filtering option (highlight a bit of quiet sound track and use that as the filter to apply to the whole track ... and the likes of computer whirring in the background is gone). Good for amplifying/attenuating also, to get the volume level 'just right'. Then use something like OpenShot to merge them back together again (use the clapper part to align the two, then cut that out once the two (video/sound) are aligned.